Atlanta is one of my favorite places to visit. This may shock you because after my very first visit I once swore that I would never step foot in Atlanta again. Well, you know what happens when you say never, right? Yep. That’s right. Someone up above definitely has a sense of humor. Not only did I visit again, my husband ended up with a short-term job in the greater Atlanta area so we spent weeks there. The city I once detested and vowed never to visit again began to grow on me. I’ve probably been to Atlanta more in the past seven years than any other city in the U.S. As a result, I’ve discovered there is much to love and enjoy in this metropolis rooted in the deep south. My new-found affinity for Atlanta included the surprising amount of green space I enjoyed with my family; from the Chattahoochee River National Recreation Area and Piedmont Park to the art and culture, to the city’s most popular attractions. 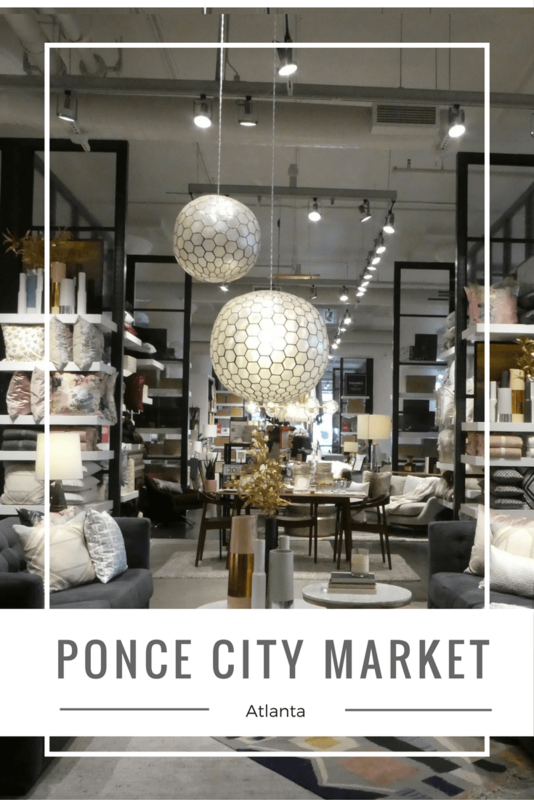 It wasn’t until a recent visit to Georgia that I discovered the Ponce City Market. One of the largest reuse projects in the southeast, the market is housed in the former Sears, Roebuck & Co. building and overseen by the developers of the popular Chelsea Market in NYC which I visited (and loved) with my daughter a couple years ago. The historic brick property is now home to a variety of shops, flats, and offices. 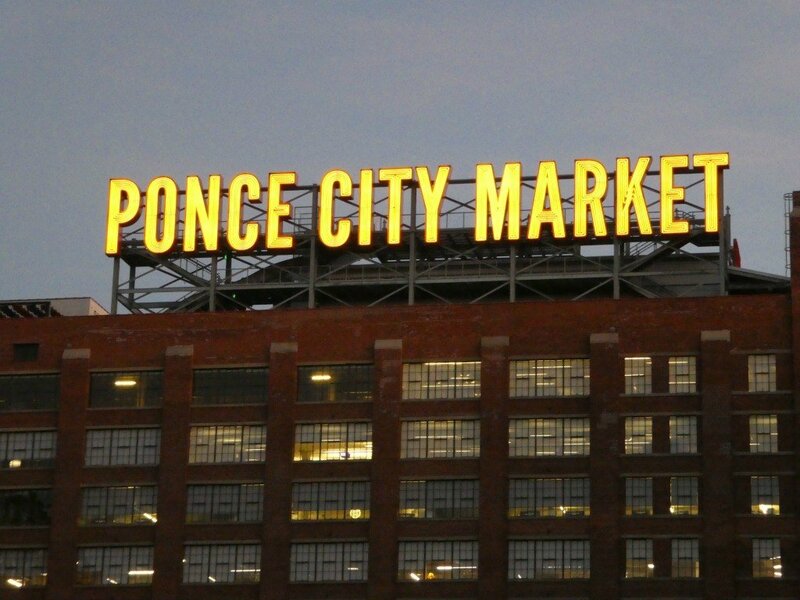 The Central Food Hall is only one of the draws to Ponce City Market. Located in the heart of the market, you’ll find an eclectic mix of classic burgers, ethnic foods, and cold-pressed juices. I couldn’t walk through the food hall, accosted by all the delicious smells wafting through the air and not grab a bite to eat. A friend claimed that H & F Burger had the most amazing fries on the planet so I happily followed her and a group of friends and colleagues into the restaurant to find out for myself. 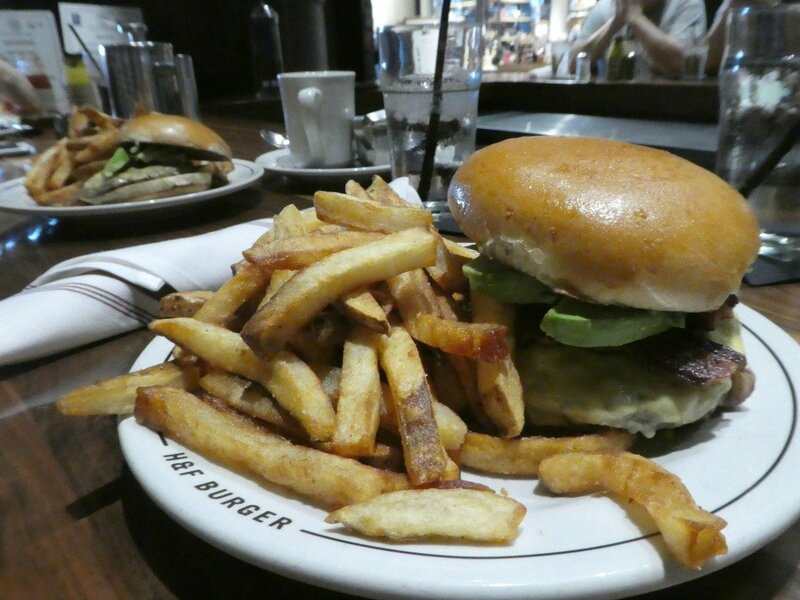 Overseen by the prestigious James Beard Award-winning chef Linton Hopkins, H & F Burger highlights their famous burger which is made from beef that is 100% natural, zero-hormone, and Georgia-grown. H & F also makes their own mustard, ketchup, and pickles. The burger and hand-cut fries and shake that I ordered did not disappoint. After lunch, I decided to explore some of the shops in the massive complex. Despite my full belly, I couldn’t resist a stop at Collier Candy Company. 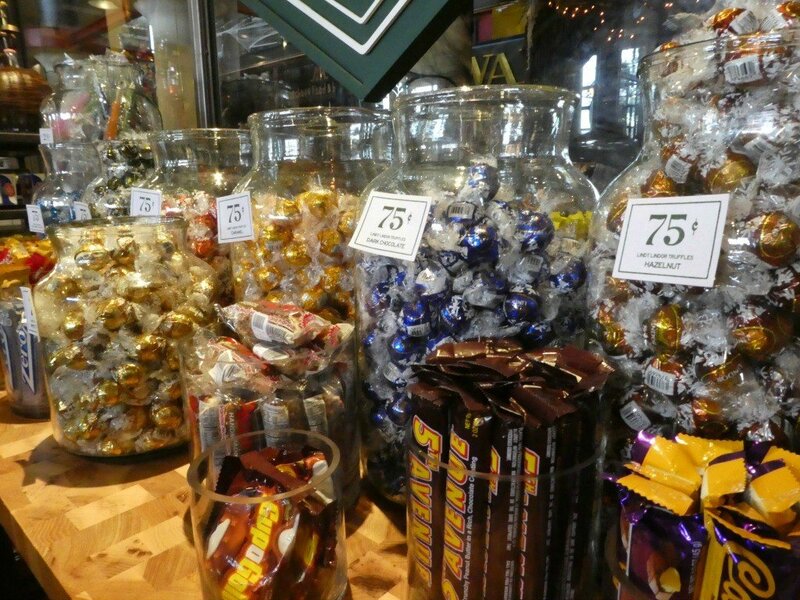 With a variety of old fashioned candies and current candy favorites, Collier’s is a fun stop that appealed to my sweet tooth. 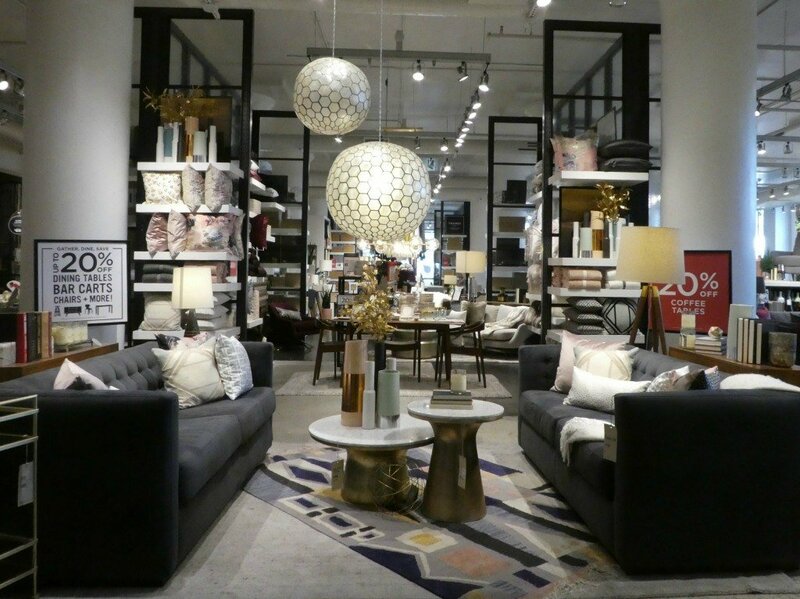 I got stuck amid the furniture and accessories in West Elm and admit that my tendency to overpack my luggage saved me from spending quite a bit of cold hard cash in this store. 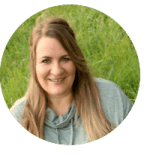 If I had been road tripping, I would have purchased several items, but since I had to hop on a plane and had zero room in my luggage, it didn’t matter how much I adored the colorfully decorated cutting board or soft throws that were on clearance for a low $12. In addition to the shops and restaurants, you’ll also find a rooftop beer garden and Skyline Park atop Ponce City Market that offers amazing views of Atlanta’s skyline. 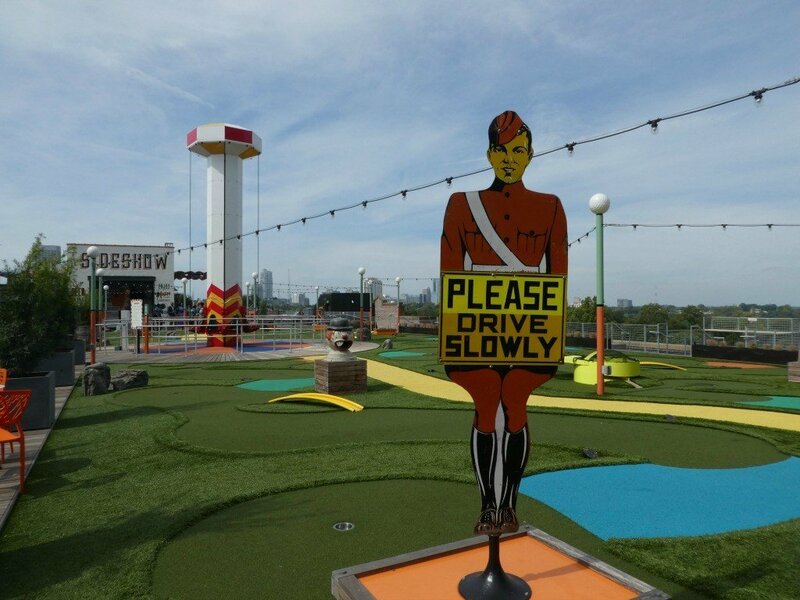 The fun zone puts me in mind of a country fair or carnival with the bright colors, games of skill, mini golf, and rooftop slide. Whether you choose to sit and enjoy a bite to eat with friends or are looking for a fun outing with the kids, Skyline Park is something everyone visiting Atlanta should experience at least once. Would you like to visit this property listed on the National Register of Historic Places? You’ll find the two-million-square-foot market sitting on 16 acres on Ponce de Leon Avenue where the Beltline crosses. For those of us that need a bit of help navigating Atlanta, you can type 675 Ponce de Leon Avenue NE in your GPS. Self-parking and valet service are provided. Pricing starts at $1.00 for the first half hour and $1.00 for each additional hour up to four and then jumps to $10 for 4-8 hours and $15.00 for 8-24 hours for self- parking. Valet is slightly higher at $8 for 0-4 hours, $15 for 4-8 hours and $20 for 8-24 hours plus tip. If self-parking you may pay for your spot using the ParkMobile app or the onsite Pay Stations that accept cash, debit or credit cards. Note that if you are paying with cash the machines do not give change. Hours of operation vary by business so check the directory listing before planning your visit. Save on last minute hotel deals in Atlanta. 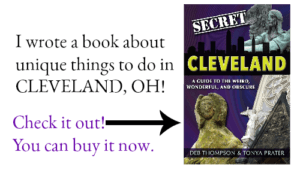 Save on food, lodging & activities with the Atlanta Edition Book – Only at Entertainment.com . Get a peek at what’s covered before you buy. 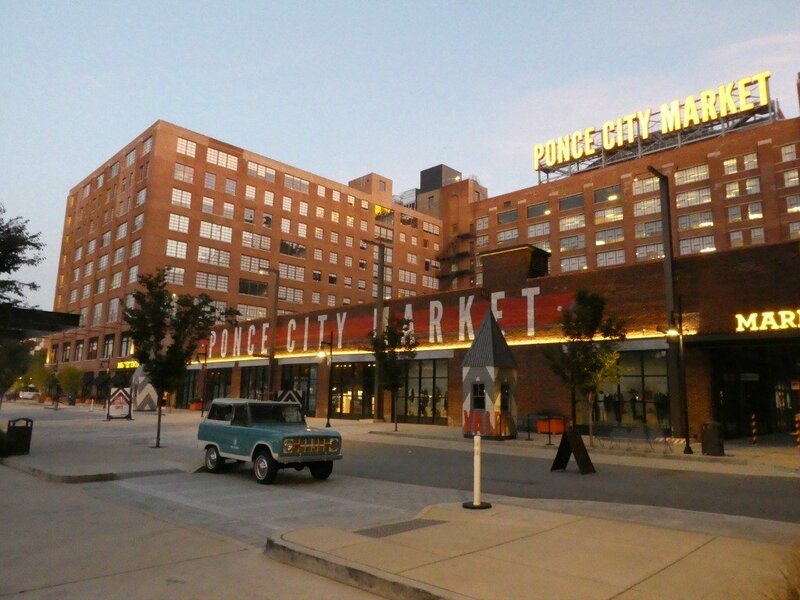 Great article sharing all these is to do in Ponce City Market! So glad I got to explore this gem retail and dining destination in Atlanta last fall. One really unique shop was “Citizen Supply” that sold handmade, sustainable gifts from local artisans and even featured the artists creating pieces in their workspace. So cool! How have I never heard of this place? I’m from South Georgia, and I didn’t know it existed. I will have to visit the next time I go home! That looks like an awesome place to visit. I would love to take my family here. The food looks so good too. This is such a beautiful place to visit. I would love to head out there. Wow, you make me want to visit Atlanta again! I swore I’d stay away because of the awful traffic. I love, love, LOVE Ponce City Market. We live just outside of Atlanta, and we make our way to Ponce quite often. It is so awesome! I live in Atlanta and had no idea the machines don’t give change. Thanks for sharing!